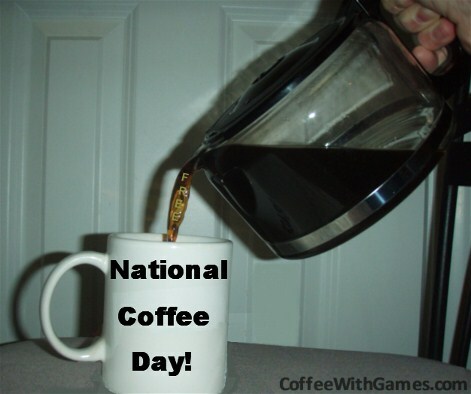 Coffee With Games: National Coffee Day Is Today - Get Free Coffee! 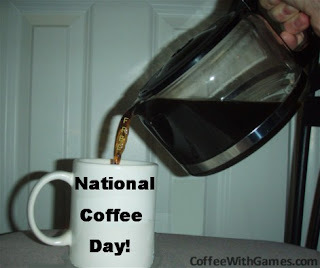 Today, September 29, 2011, is National Coffee Day in the United States. One month ago, I posted how CoffeeWithGames.com had turned two, and to celebrate I announced the contest/giveaway for 2 years' worth of coffee. I had no idea at the time that the day I chose for the contest to end, which is today, was National Coffee Day! Kind of ironic the way that happened, but I thought it was pretty cool when I realized it. If you are out and about today, keep an eye open for any coffee shops, gas stations, or fast food restaurants that are giving away free cups of coffee. Also, if you enjoy brewing up your own coffee, you have just a few more hours to enter the contest/giveaway for the 2 years' worth of coffee I am giving away. You can enter that contest HERE! So far, I have had two cups of Maxwell House's Master Blend coffee today, and I am currently finishing a third cup now. I don't think I'll be venturing out to get a cup, but if I do, I'll update where I get my free coffee in the comment section below! What coffee drinks have you had today, and did any of you not know that today is National Coffee Day? Also, if you find a store that is giving away a free cup of coffee today, feel free to name it in the comments below! I had no idea it was national coffee day. I got a heads up from someone that it was national coffee day, but I had no idea. Really cool though! Had my 5+ cups of Melitta as usual (breakfast blend I think) this morning. No such luck with free coffee though, not even at Chick-fil-A..
@Parko: Rock on with your melitta self. :) I hadn't heard of the Estate Blend. Is it only in Canada? Well, mark it in your phone's calendar as a popup reminder for next year...then all that is required is finding what stores are giving coffee away! Wow, kind of interesting you drink Melitta, because Robert was the only reader I could remember ever mentioning it before. The Presidents Choice Chocolate Raspberry blend, was that also a Melitta blend? Yea, I didn't leave to go look for free coffee, but I did let my work know today that I was ASHAMED nobody knew it was National Coffee Day. My very first week at CFA, I mentioned to our store owner that CFA should do coffee promotions called, "Coffee with Cows!" or something along those lines, and have the cow outside at a certain time for pictures...but National Coffee Day comes and goes, and NOTHING! Thank you all for the comments...shame nobody found any free coffee though!